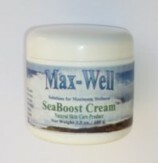 SeaBoost Cream is one of the greatest products for people with dry, itchy skin. Numerous people have even used it for their psoriasis, and found it to work wonders. SeaBoost Cream is an all natural skin care product, containing no artificial colors or fragrances. It is a blend of condensed sea minerals, herbs, avocado, beeswax, and macadamia and olive oils. To use, apply a small amount to the affected area and rub gently. Best applied nightly, or morning and night. Be aware that SeaBoost Cream™ may sting if applied to broken skin. Stevia, Sheep Sorrell, and Stinging Nettle.